Thirty years ago the Episcopal Church adopted a new Prayer Book that encouraged congregations to sing the psalms. Most congregations had no experience of doing that. Either they let a choir do it for them or they said the psalms – if they used them at all. To get with the new program, I sat down with the parish organist to talk about how we could sing the psalms. There are several long-established methods of singing the psalms: plain song going back into the early middle ages, Anglican Chant going back to the sixteenth century, and the Gelineau method that gained popularity some fifty years ago. The organist didn’t believe congregations could use any of these successfully. Rather than argue the point, I suggested metrical psalms. The King of love my shepherd is / Whose goodness faileth never. Nobody talks that way anymore, if they ever did, but we’re used to it and don’t notice. But when an unfamiliar psalm comes up, the antique wording makes it unusable. So, why not make a modern metrical psalter? I set out to do it, a few at a time. We used them in Advent or Lent or a few weeks in Pentecost, Year A, Year B, Year C. Eventually we built up a sizable number and I began to wonder whether other congregations could use them. To make a long story short, A New Metrical Psalter was published twenty years ago and has been widely used. I have letters from churches all over the country requesting permission to use them. I always give permission with no fee. An order of Roman Catholic nuns asked permission to use them in their daily offices. I gave them permission too. A Lutheran publisher wanted to set them to tunes by George Frederick Handel. A Roman publisher wanted to set them for liturgical purposes. Local organists have set them to new tunes – one for an anniversary celebration, for example. 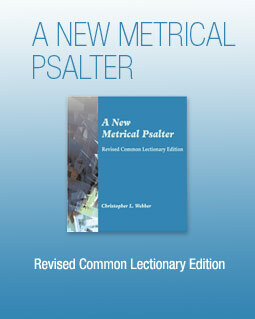 But A New Metrical Psalter includes only the portions of psalms required for the lectionary and now we have the new Revised Common Lectionary that requires different psalm portions. Also, A New Metrical Psalter tried to stay as close as possible to the language of the Book of Common Prayer of 1979 but that was not inclusive language. Therefore, over the last couple of years I have reworked the original to fit the new lectionary and to use inclusive language. Marilyn Haskel, an editor with Church Publishing, challenged phrases that were not as felicitous as might be desirable. The result is a new, improved New Metrical Psalter now available from Church Publishing Incorporated (www.churchpublishing.org). Be warned, however: this is not a book that Gutenberg would have recognized. It has no pages or covers. It is downloadable to you for a fee. So if you have an unsophisticated congregation that likes to sing and are sufficiently sophisticated technically to download a book one psalm at a time or the whole thing – do it. It does make it easy to sing the psalms. If you can sing Old Hundredth and St. Ann, you can sing these psalms. Now you know! Pass it on!